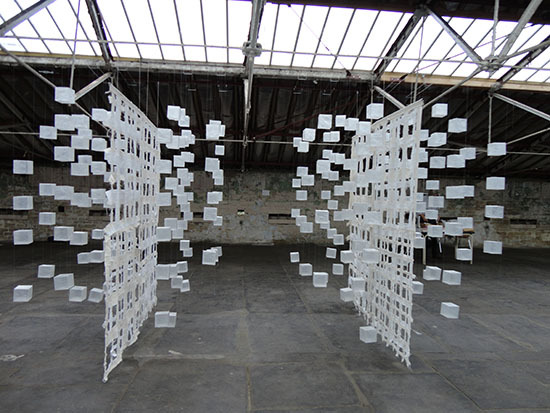 You have several weeks yet to visit Cloth & Memory(2), dramatic, site-specific exhibition located in the UNESCO World Heritage Site, Salts Mill, Saltaire Yorkshire UK. Cloth & Memory(2) takes place in the original Spinning Room (known as The Lobby), which when first built was thought to be the largest industrial room in the world. The extraordinary internal architecture, with its peeling walls and floors still retain the marks and smells of its original use. 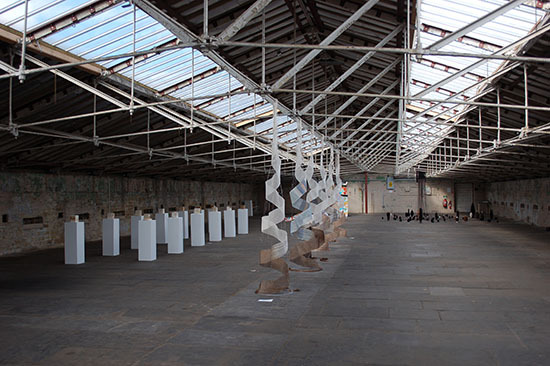 All the works engage with the palpable history of place that is evident at Salts Mill and The Lobby in particular, and range from large scale interventions in space to highly intimate placings within the fabric of the building. The exhibition’s curator is bga contributor Professor Lesley Millar of the University of Creative Arts. 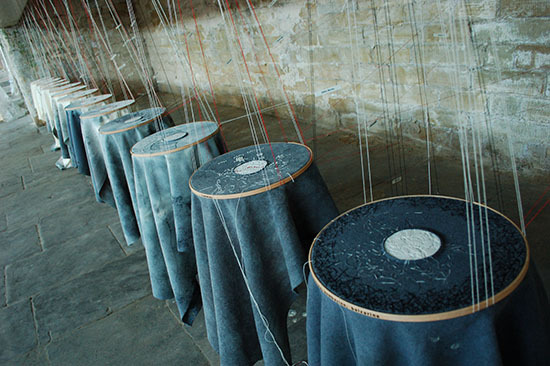 Informed by the knowledge that “cloth holds the memory of our time and connects us with the memories of other times and other places…,” the exhibition features 23 artists drawn from Europe, Japan and the UK. Among the participants is Caroline Bartlett (UK), whose work involves a number of large embroidery hoops within one of the wall bays. 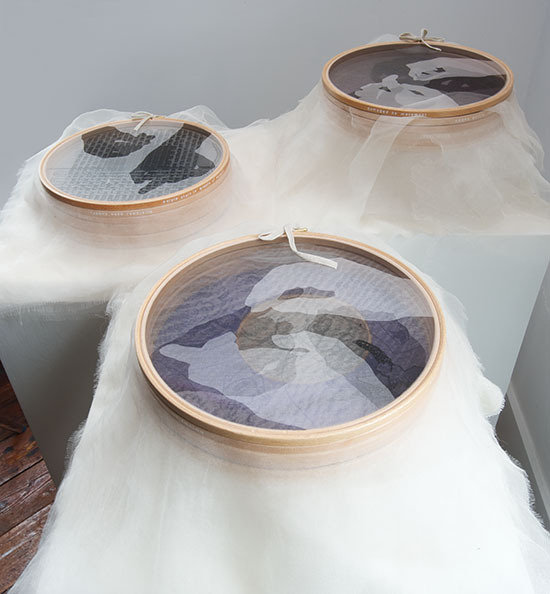 Each stretched, stitched, woolen cloth piece will be inset with a small porcelain round, imprinted with an impression taken from a fragment of textiles. Bartlett has long been interested in the indications of other histories being formed through textiles and the journey that they take. Cloth and Memory(2) runs through November 3, 2013. There are curator, coordinator and artist tours each Saturday through the exhibition’s closing. 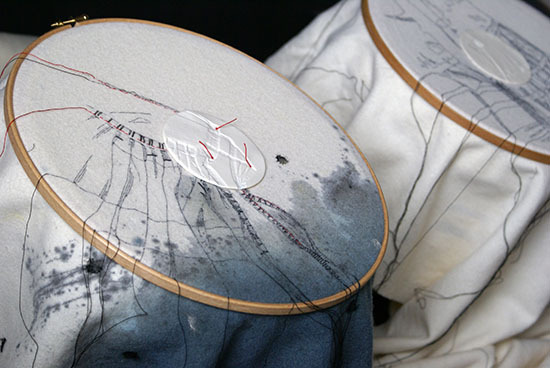 If you can’t visit Yorkshire in time, be sure to visit to exhibition’s website at: http://www.clothandmemory.com. There are images, a video tour, narrated by Lesley Millar and an order form for the comprehensive catalog. A few more interesting books and catalogs arrived in our mailbox over the last couple of months. 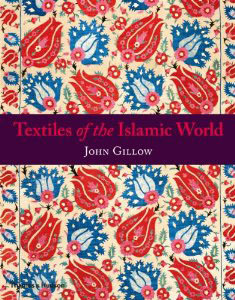 First up, the truly luscious Textiles of the Islamic World by John Gillow (Thames & Hudson). A dealer in Asian folk textiles, Gillow has been traveling to Asia and the Middle East for 40 years. The oversized book, with more than 600 color images of cloth of cotton, hemp, velvet and silk knitted, quilted, felted and hand woven, aptly succeeds in its aim “to supply a broad survey of the textiles produced today and in the past in the Islamic world, putting them in their social and historical context.” Another interesting survey is Grethe Wittrock’s small color catalog, Grethe Wittrock: Works 2006 – 2012. 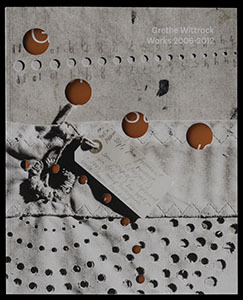 The book includes images of her paper wall hangings and her recent work with sails. We received two catalogs from recent exhibitions featuring work by Gali Cnaani. 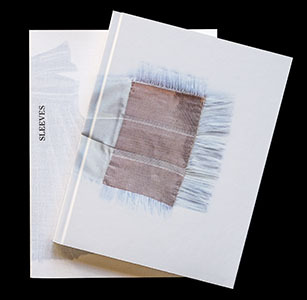 The first, Gali Cnaani/Oslo XXL, includes images of woven works and wallscapes of stacked books, The second is the catalog for Gale Cnaani: Sleeves, the exhibition currently at the Tel Aviv Museum of Art in Israel. In this exhibition, Cnaani has created “a new anthology of weaving” by dismantling parts of second-hand clothes that have been unraveled and re-assembled to form hybrid textiles. In doing so, the Museum says, “Cnaani subverts the dichotomy between the garment and the deconstructed structure and pattern, between industry and craft, between garments and cloth.” The catalog contains images of these provocative works, informative essays and interviews with the artists. You can also watch an online tour of the exhibition, narrated by the artist in English at: Cnaani is a 2013 recipient of the Andrea M. Bronfman prize for Contemporary Crafts (the Andy Prize) awarded annually to an Israeli decorative artist for excellence in ceramics, jewelry, textile, glass or fashion. The exhibition runs through December 14, 2013 in The Agnes and Beny Steinmetz Wing for Architecture and Design, Galleries 1 and 2, Herta and Paul Amir Building, http://www.tamuseum.com/about-the-exhibition/gali-cnaani.